How cool is this! This is a topographic carving of Hillman’s Long Lake. Tom ordered it special for us from Backwoods Carving. Every depth on the carving is the equivalent of 10 feet for real.So the deepest places are 90 feet, just north of Belly Button Island. The carving even includes the little island in the south part of the lake. We’ve had a little printout of the fishweb site map framed and hanging at the lake for nearly ten years now. 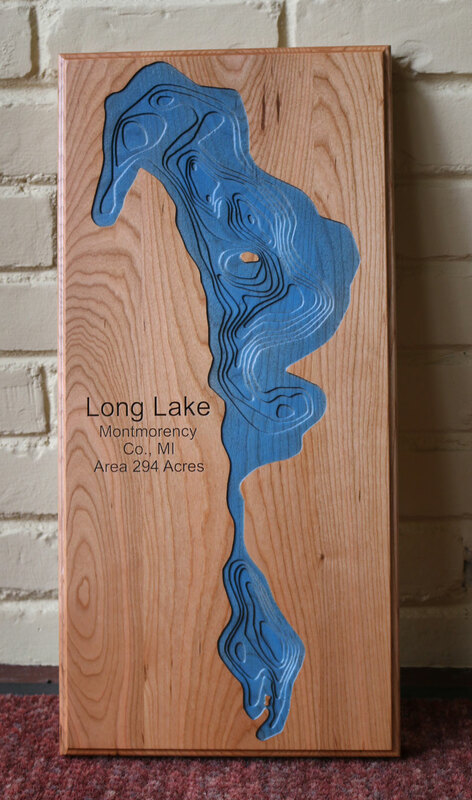 We show it to people, complete with a little house drawn on the map so visitors will know where we are on the lake before they head out to kayak. 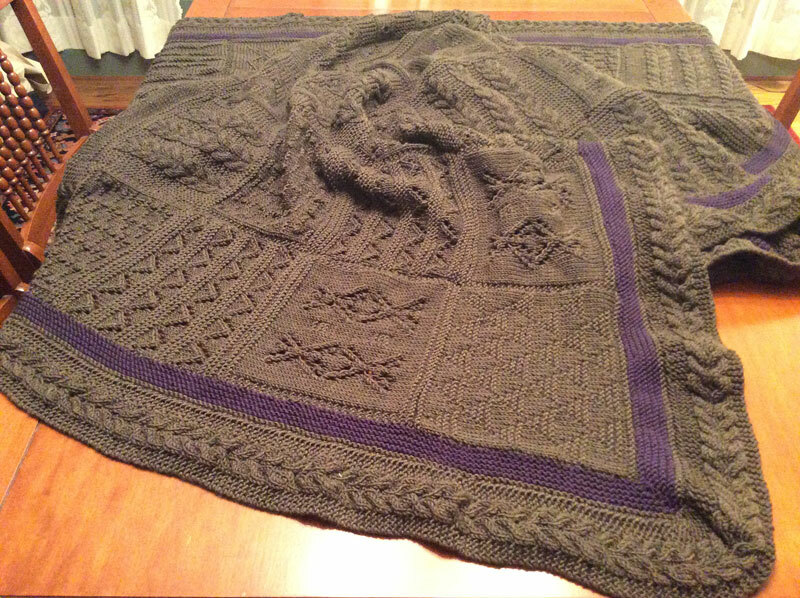 This is Martin Storey’s afghan. Actually it’s Tom’s, but Martin Storey designed it–with a teeny bit of help from me. I made just a few modifications. This blanket fits on a queen-sized bed with it’s border hanging a bit down on all sides. That’s a lot of knitting. 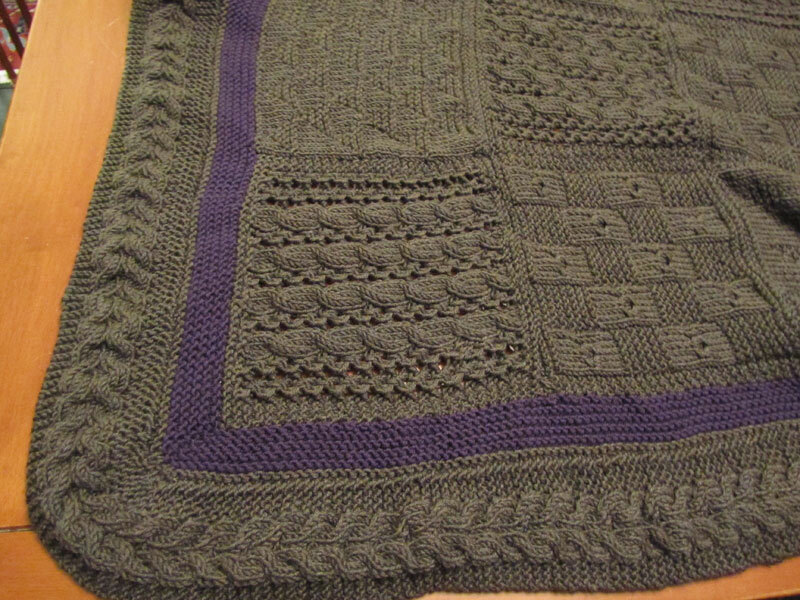 I used just under 20 skeins of my new favorite yarn: Plymouth Yarn Select Worsted Merino Superwash. I know, that’s a mouthful. But it’s a more descriptive mouthful than Devildash Down The Creek or Mrs. Smith’s Bread Box. Patterns have taken on oddball names of late and yarns now compete in the oddball name department. So I am quite satisfied with Plymouth Yarn Select Worsted Merino Superwash. It tells knitters all they need to know. 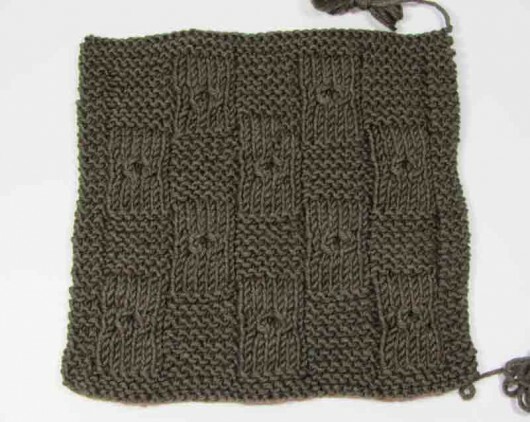 The only thing wrong with the yarn is, even at 218 yards a skein, $14.95 is too expensive. But when you need 20 skeins that WEBS 25% discount brings the price to the normal and comfortable range for wool. Check out the beautiful colorways. This one is Basil. And that pop of purple border is, well, Purple. Storey’s pattern is free on the Rowan website, still spread over 9 PDFs. 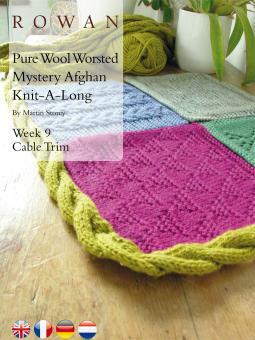 The pattern was first released in weekly installments as a Mystery Knitalong. Being timid about risking committing to a pig-in-a-poke, I waited until hundreds of Ravelers had knit the Storey before I decided to start mine. By then I knew this was going to be fun. 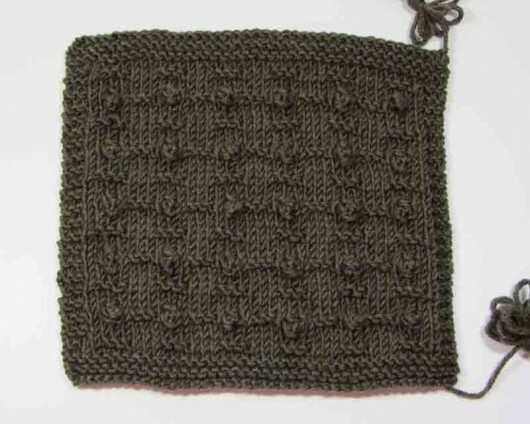 You knit six squares each of eight different patterns. 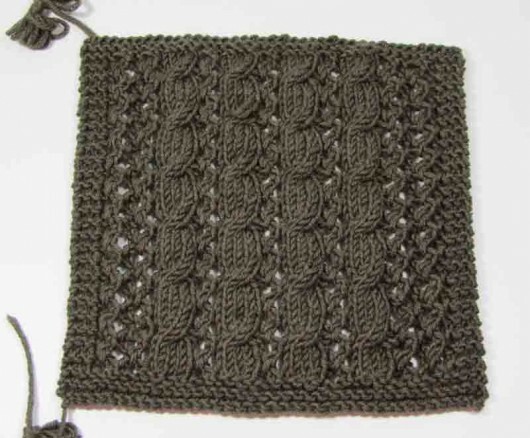 These harsh-light photos show the squares well and also showcase this yarn’s great stitch definition. 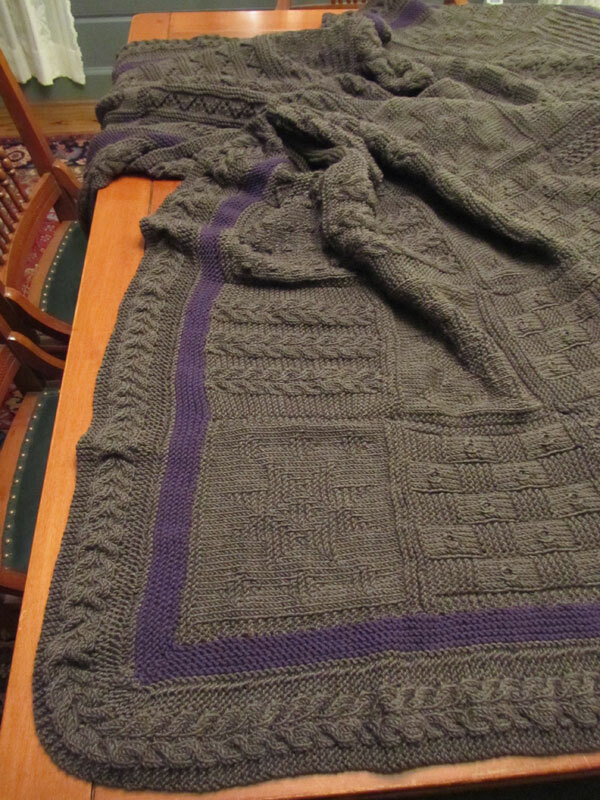 After the great fun of knitting the squares comes the great tedium of mattress-stitching them all together. 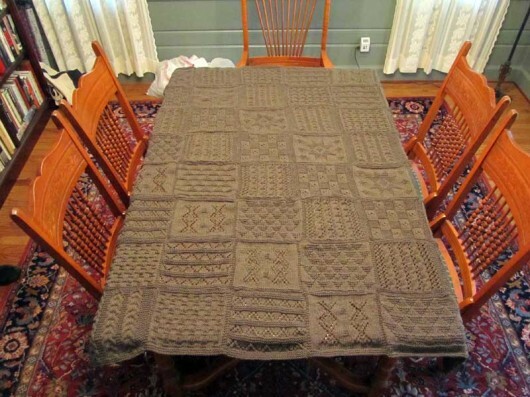 That took dozens of hours working at the table I inherited from my mom. She used to quilt at this table. And before that it belonged to her mom. Gram used to keep it in the basement and put spare cookware and dishes on it. 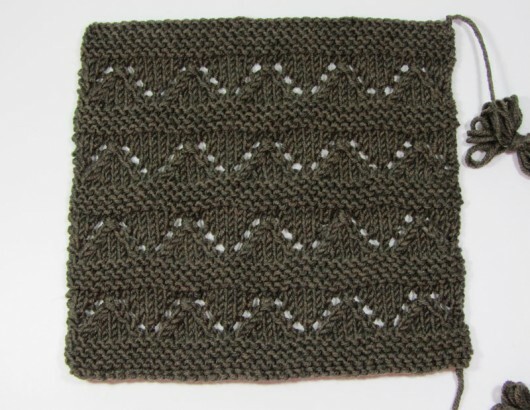 It’s also when I realized that I sewed one of the Garter Waves squares in upside down. See it? The fourth square as you move on the diagonal from the bottom right hand corner. Either that, or I sewed its five sibs upside down. It’s OK though. It will be just as warm the way I left it. A lot more colorful. My version is inspired by the afghan that Rowan Ambassador, knitter extraordinare, Dayana Krawchuk (Dayana on Rav) knit. You can see it here, on her blog, with internal links discussing her modifications. Actually, it’s not fair to say she inspired mine. I was a total copycat. Except for the border. After all that mattress-stitching to get the pile of squares turned into a blanket, I didn’t want to face more sewing. I picked up stitches all around the edge, about 35 to a square. That might have been a few stitches too many. But it was behaving nicely at that point. No curling or ruffling. 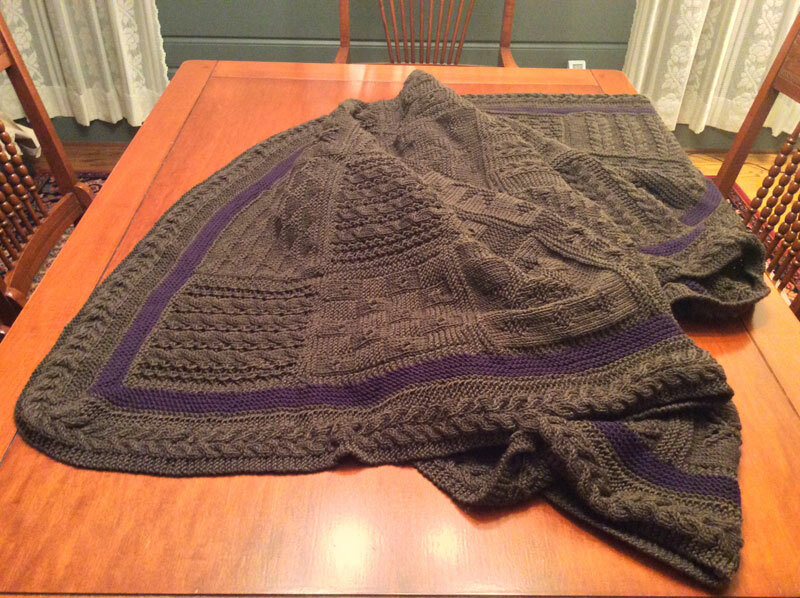 I used four 60-inch circulars to pick up the stitches and knit the border. Then I knit 5 garter stitch ridges (10 rows) in purple and one ridge (two rows) in basil. 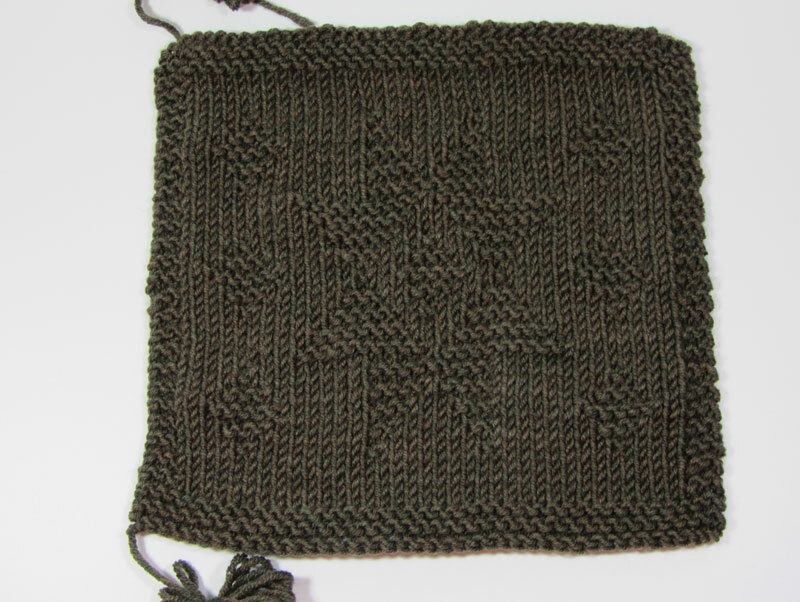 I mitered the corners, increasing one stitch on each side of the marked corner stitch on each knit round (working the purl rounds without any increases). Next came the last tweak. Row 1: k4, C4B, P1, C4F, K3, K 2 tog thru the back, “using” one of the live stitches off the border, turn. Row 2: K4, P4, K1, P4, K 4, turn. Row 3: K8, P1, K 7, k2 tog thru back, with 1 of the live stitches, turn. 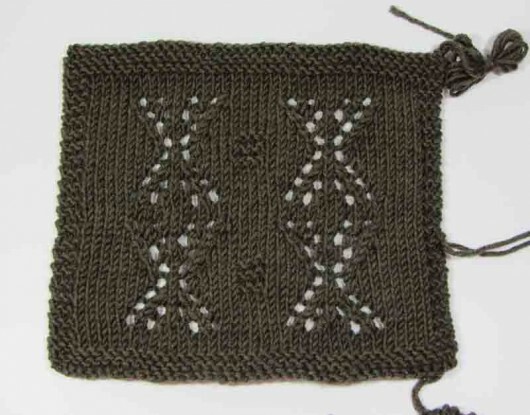 At the corners: three stitches before the corner stitch marker, I worked about 18 rows of border (just as the above) but not attaching it to the body of the blanket. I put the next 6 stitches on a yarn holder (same color as body of yarn). On the last stitch of the 18 unattached rows, I knit through the back of the next stitch still being held on the needle. (Skipping those 6 stitches on the yarn holder). I knit a few more inches of attached border, then went back and used the yarn holding the 6 stitches to sew the gap closed. Turning the corner this way worked pretty well. The only problem with my modification is that I’ve got a bit of a ruffle going. Tom doesn’t mind. Neither do I. 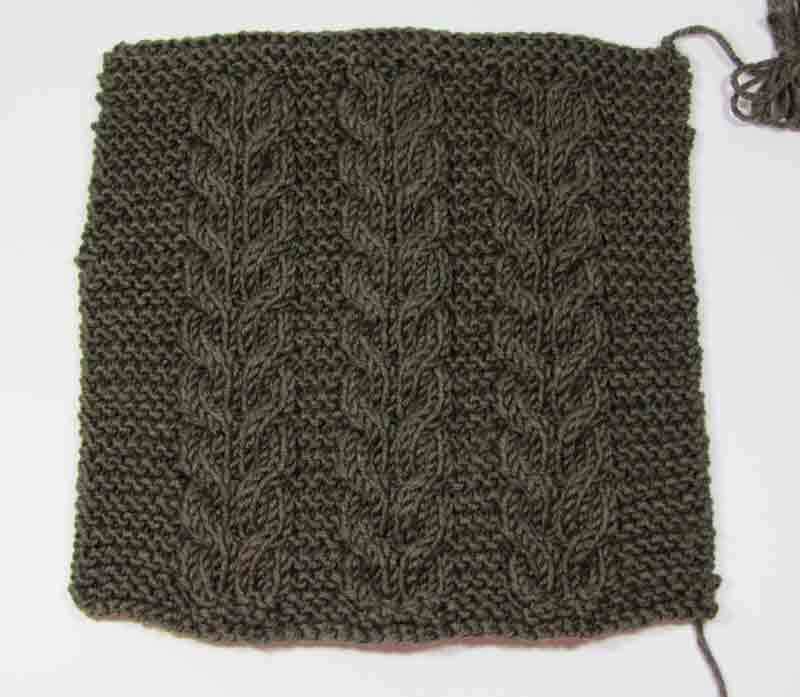 Knitting this border on, instead of sewing it on, was a good idea for a sewing-impaired knitter like me. If you decide to try it, be prepared for a long slog, though. I really like the results and love the idea that it will keep my brother warm. The first dustings of snow have fallen. And yes it’s “sticking,” though there’s no accumulation yet to contend with. Long Lake is teeming with mergansers, black ducks and buffleheads. But I’ve still not boasted properly of all the winged things we’ve seen this year. 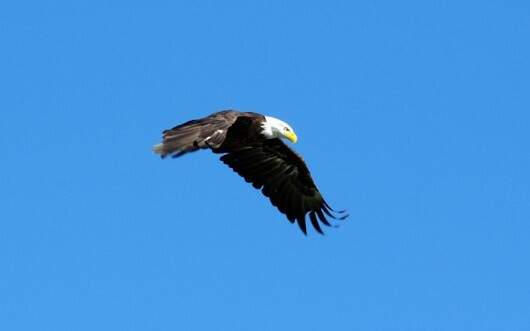 We had more Bald Eagle sightings than any other year. 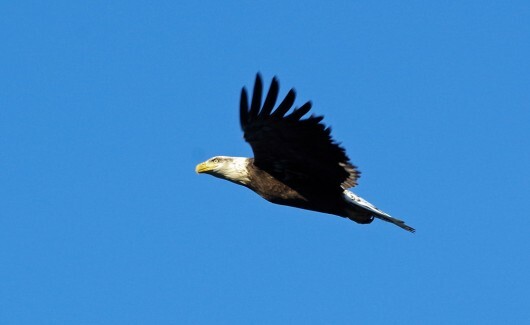 Since the eagles don’t migrate we’re hoping to continue the sightings through the winter. But it will be more difficult now that we can’t float around on the lake. Snow shoes will be an option soon though. What a creature. What a great blue-sky day that was. 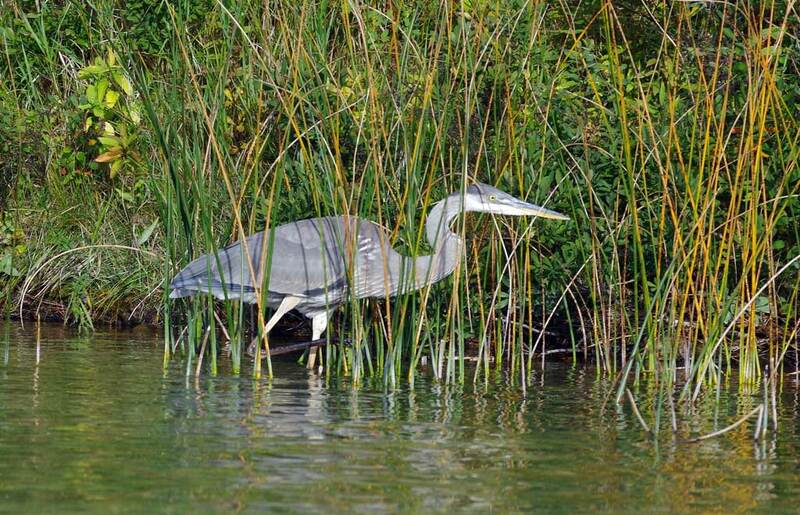 We watched a Great Blue Heron patiently stalking prey on the shores of Ghost Bay for at least half an hour one early morning. We tired of watching before the heron tired of stalking. When we are patient ourselves, and quiet like the heron, we can drift around in our kayaks and not disturb the hunting. A few times the heron looked like it was doing the heron equivalent of salivating, but we didn’t see it catch anything. 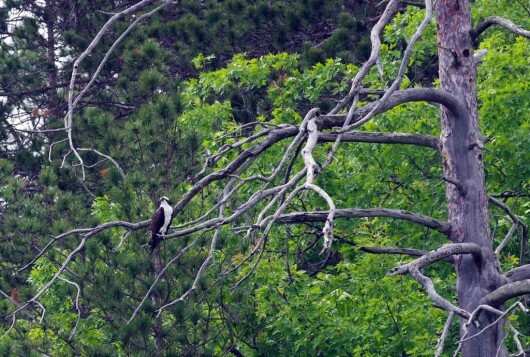 We watched this osprey in one of the dead trees in the south lobe of the lake, very near to the narrows, for a good bit. Steve was minus his best camera for wild life photography, so maybe the tree is the star more than the osprey. But what a pair! And when the sea gulls are not trying to snitch french fries from the Alpena McDonald’s/Home Depot parking lot, they can be quite the dignified bird. This one was perched, late in the fall, on what remained of the “this-will-kill-your-prop” now-submerged rock pile near Belly Button Island. We imagine it hadn’t gotten to stand on those rocks all summer because it wasn’t anywhere near the top of the pecking order. 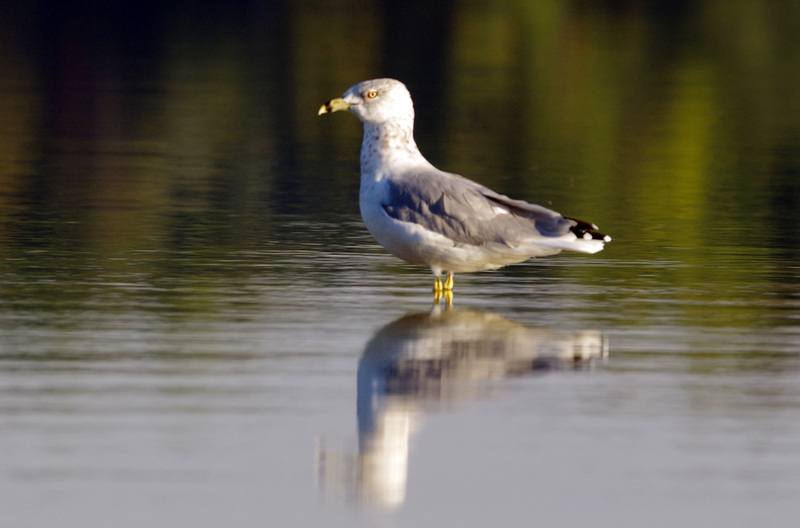 There are still some gulls on the lake. Maybe this one is still sitting on the rock, making it look like he can walk on water. There is some disturbing news, though. 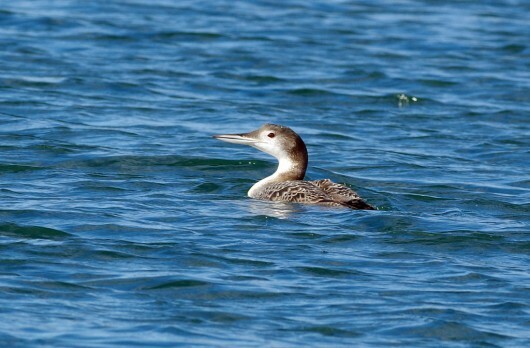 We were quite sure this year’s adolescent loon had flown off nearly a month ago. Steve saw it take flight and head high and upward. We are hoping that the little goofball didn’t get mixed up. But whether its “our” adolescent or another who just happened to make its way somehow to Long Lake, as of November 15th, with the snows closing in, there is still an adolescent loon on the lake. Honestly, this one–who we haven’t seen up close for a few weeks–looks to be smaller and somewhat lighter colored than the young one we watched all summer. We worry it’s this year’s chick, which certainly seems likely, and that it’s ailing. This photo was taken in early November. But we saw him yesterday, November 15th. He’d caught a fish. 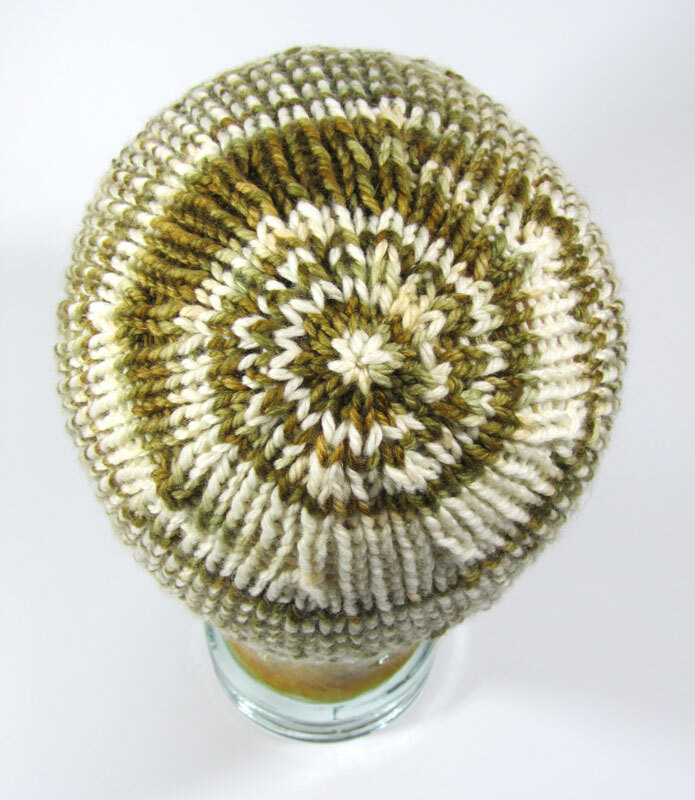 This is Knitwise Design’s Hunting Season Hat. As all walkers during hunting season know, blaze orange is the best defense for assuring that hunters see you from far away and don’t shoot anywhere in your direction. Linda knit hers, above, in Briggs & Little, Heritage. The Hunter Orange colorway is the perfect choice. 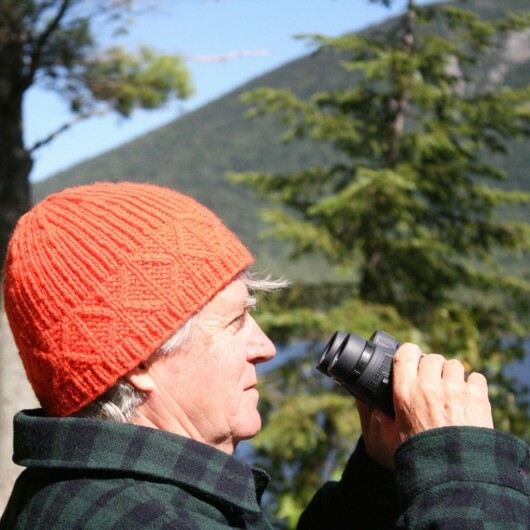 I wanted to knit Linda’s pattern, but decided I didn’t need another blaze orange hat. 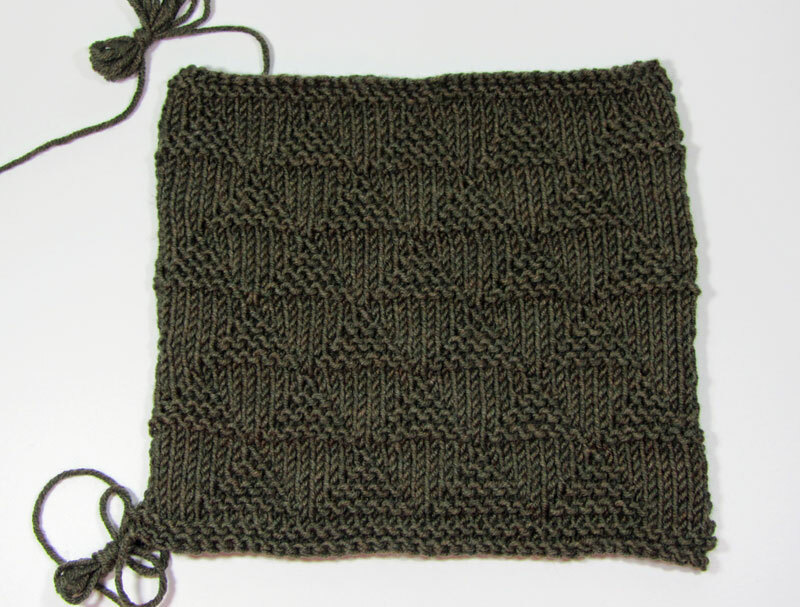 I did a total about-face and knitted mine in what turned out to be almost a camouflage colorway. So definitely no part hunting season hat. This is Gecko Yarns Cash Aran Superwash. It’s a wonderful 80% merino, 10% cashmere, 10% nylon confection. Warm. Soft. With just a bit of bounce back. I enjoyed knitting Linda’s design so much that I immediately cast on for another, this time in Martha Stewart Crafts Extra Soft Wool Blend. 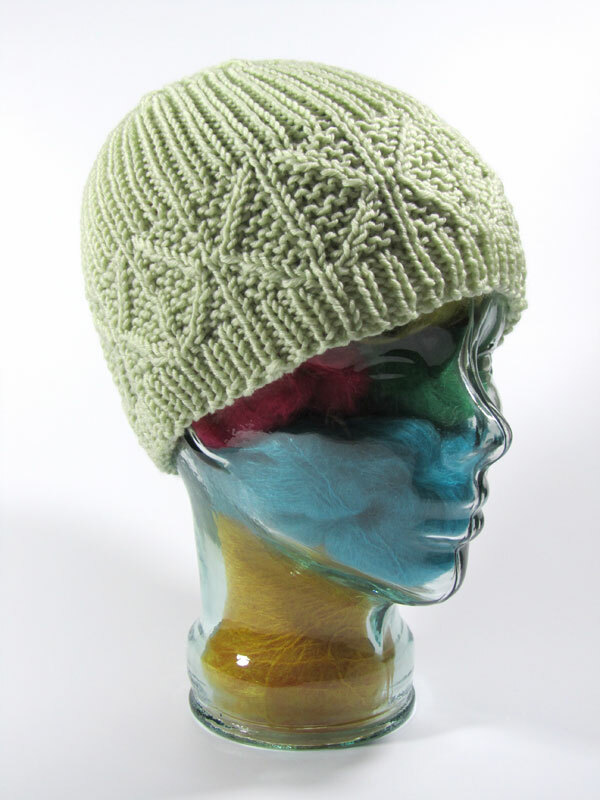 Possibly it isn’t the snazziest colorway (celery). 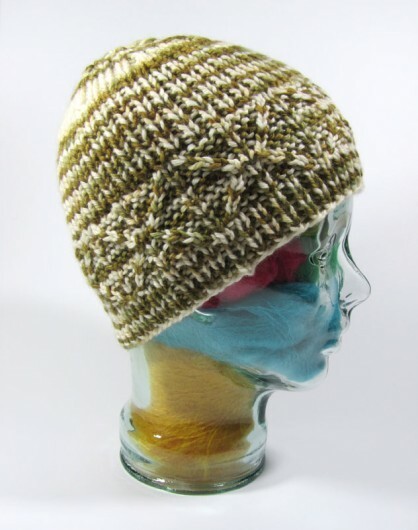 But the yarn has wonderful stitch definition and the hat turned out great!